What are the roads like in Zambia? The short answer – terrible. And it’s the potholes that do it. They come in all shapes and sizes – miniature, jagged edge pockmarks; surprise road-width trenches that sneak up on you, corrugated fill-in jobs. 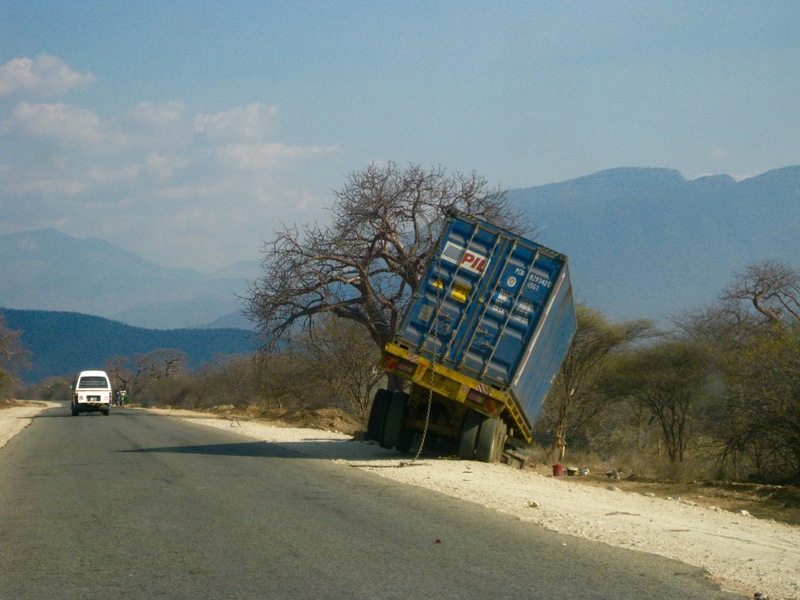 Driving on a Zambia highway is therefore absolutely unpredictable. 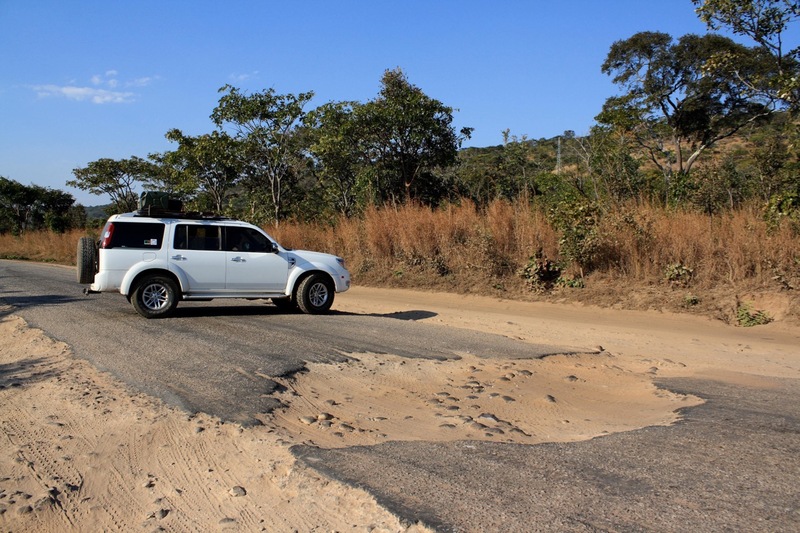 Here is a guide to some of the most terrifying potholes in Zambia you should watch out for. The first potholes out of Kabwe were the size of garbage bin lids, about 10-20cm deep, and were littered randomly all over the road. Attempts had been made to fill some of them with asphalt, but this just exacerbated the problem and created irregular lumps in the road. We could counter these by driving in a slow slalom. People had warned us about the state of Zambia’ roads. For smaller roads, we expected this; but the potholes in the middle of major highways took us by surprise. We drank our awful freeze-dried chicory coffee-style drink, the sour tasting Ricoffy, and strapped in for the highway battle. Where locals have tried to fix a pothole, they fill it in with rocks. The result is a crater filled with a lumpy mix of teeth-rattling rocks, that sometimes pop up and create a knobbly speed bump. When you hit one, it feels like the wheels are going to get ripped right off the axle. Approach these at extremely low speed. But we hadn’t seen anything yet. As we ventured into more remote parts of the country, we hit our first seriously big pothole. It was a knee-deep trench, about two metres long, spanning the entire width of the road. And the worst part? They’re completely invisible until you’re on top of them. We were coming down the road at a rocketing highway speed when the pothole appeared. We stamped the brake pedal hard into the floor, sending any luggage that wasn’t tied down hurtling around the car. We screeched to a halt with the front wheels in the pothole, and looked at each other incredulously. My hands were sweating. That was close. As we saw more and more of these trenches, we grew accustomed to how to spot them. Thick black tyre marks from previous victims were always a good indicator that a pothole was close, as well as offroad tracks to either side of the road where people drove around. We always drove around using the flanking tracks, which sometimes had potholes of their own. Along the way, we stopped in enormous craters big enough to park our car in (for some incredible photos). 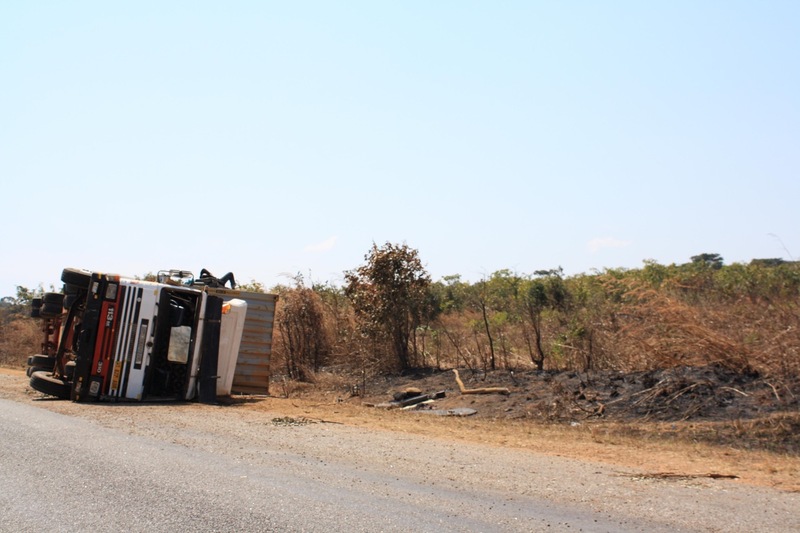 Zambia’s highways can be ruinous to trucks, and we started seeing more and more semi-trailers which had actually flipped onto their side. These were usually close to the deepest trench-style potholes (unless speed or alcohol was a factor). Some of the giant vehicles were stranded in the sandy ditches by the highway, others were completely burnt out shells. 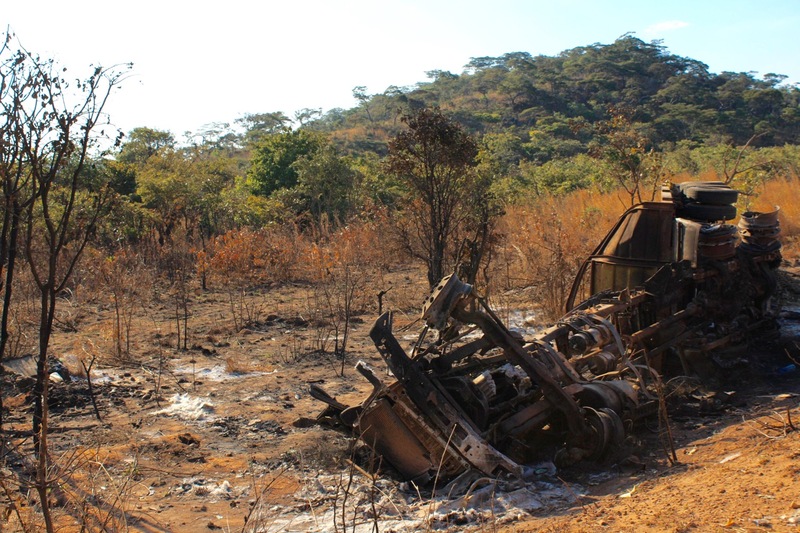 Drivers would sometimes be asleep in the cabins or lying on top of the trailer, stranded in the middle of nowhere with no more working transport. There was even a signal system to warn of a crash site; leafy tree branches lined up for a hundred metres or so on the asphalt. Trucks still in service always assisted us to overtake them, by indicating right if dangerous, or left if clear. We stopped at a tiny truckstop called Serenje to rest. Clingy yellow dust covered everything and the roasting hot sun was directly overhead in the wide blue sky. The (never cleaned) toilet was one of the worst I had ever seen in Africa. We didn’t even use it, despite having paid the fee. A local shop sold hot dogs, which were propped up in a glass-doored oven, and looked as though they had cooking in the heat for days. We ordered Cokes, and drank them as fast as we could at the insistence of the shopkeeper, who wanted the empty bottles back. With three hot dogs, we sat down and took our first bite. I chewed slowly, staring down at the fluorescent pink meat inside. I looked worriedly at Jeff and Wessel, who were also eating theirs slowly and skeptically. I couldn’t clear my head from alarming words like food poisoning…tapeworms…hepatitis. I never finished it.